» How about a local gas tax? How about a local gas tax? The closer you look, the more this part of East Fifth Avenue looks like a canyon. 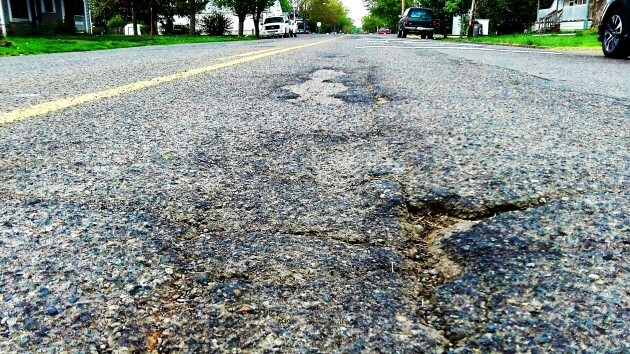 The pavement on many of Albany’s older residential streets has been in pretty poor shape for years and isn’t getting any better. Mayor Sharon Konopa thinks that a local gas tax would enable the city to make progress on that front. She brought up the subject Monday when the city council was reviewing changes in its “strategic plan.” The plan mentions street maintenance, and the mayor wants it to include the possibility of new revenue to pay for more of it. Konopa talked about a regional approach to a local gas tax with Corvallis Mayor Biff Traber last year. Traber confirmed this when I talked to him Tuesday. He said a task force of the Corvallis council has been considering a gas tax as one of the ways of meeting his city’s unmet needs in regard to streets. The idea is that Albany and Corvallis voters would be asked to approve a gas tax at the same time, but Traber says that while there’s definite interest in the idea on the task force, the timing remains uncertain. How about taking some CARA money and improving the streets with that instead? Because that would be stupid. CARA money should be dedicated towards improvements that benefit private property that will result in an increased assess value to generate the additional tax revenue to repay the CARA Bonds. Just generally throwing CARA money at citywide streets needs in general revenue doesn’t raise assessed valuations. Bob is right. Using the proceeds from CARA debt on street repairs is rather stupid given the tax increment is zero. And that means CARA’s recent decision to budget $7,879,000 for “streetscape” improvements is equally stupid. You do agree, don’t you Bob? Wrong, Mr. Purveyor of inadequate thinking. Those streetscape improvements directly benefit the target businesses, and work to increase the value of their properties. Bob, Most of the money left in CARA is for non private uses and does not make a tax increment. Rich if my property becomes more valuable because of public improvements next to my property, the assessed value goes up. Is that a sure thing? No. The market has a big hand in the equation. You may be afraid to be a Turtle. I aspire to be an Eagle, head out and proud. Yet the Mayor/City Council have no qualms about tearing up decent streets and sidewalks in the inner city and replacing with “promenades”. Sometimes you just want to smack someone on the side of the head. Like others who comment on your blog, I have no skin in this game. I no longer buy my motor vehicle gas in Albany. But Albany residents should be thankful that ORS 319.950 requires the city to submit this tax to the electors for approval. Otherwise this council would have unilaterally imposed the tax. This council hates having to get voter approval for anything. Also, will Albany have ODOT be the collection/disbursement agent? Will voters be told how much money ODOT will skim? Finally, will the council sell this tax to voters as ‘temporary’? No one should fall for that lie. I could support a 3 cent gas tax if the details were right. * The tax must be kept local — if it’s an Albany tax, then it is for Albany streets. If a Linn County Tax — then for Linn County roads, etc. * The funds must be used solely for street repairs — not unnecessary things such as bulb-outs, or other decorative features of dubious efficacy and utility. * Openness and accountability in how much money is collected and on which projects it is spent. I do have concerns about how this may impact local businesses. Folks who travel to Salem regularly, will fill up there if it’s cheaper. It could impact local business sales. I also have long term concerns on how this may be complicated by the mileage-tax which Oregon is experimenting with. Here is an alternative – don’t let CARA siphon about $1,000,000 per year from the city’s general fund. Instead, put that money in a dedicated street fund. Do it now. It won’t take long before the fund accumulates, perhaps enough to do the slurry sealing the Mayor whined about. I’m not holding my breath, though, that this council will do anything that threatens their favorite slush fund. Of course CARA would first have to pay off their huge deb before any money would become available. So, pay the current debt, no new urban renewal debt, then dedicate the $1M windfall in the general fund to streets. Chances of this happening? Zero, given the current makeup of the council. They’d rather keep their slush fund and hang a gas tax around the necks of everyone. Typical politics. 30 or 40 cents more per fill up might be easily swallowed now. tax won’t go down as nicely. cars by then. Doubt it though. than taxes. Just look to the comments section here. It’s a perception vs. reality concern.